The global payments paradigm is changing. Worldwide, the dominant international card schemes battle against ever-increasing fraud, exposing their underwhelming response to the emergence of card-not present transactions. In the developing world, banks are looking to mobile technologies to capture payments by the unbanked and remove reliance on cash. And in the first world, disruptors are carving out pieces of the market to capitalise on new technologies, widening gaps in niche market payment scenarios, particularly for e-commerce and m-commerce. But, according to the report, the existing domestic schemes have to up their game. They have to recognise that they are now in a much more competitive market and that they need to act more commercially. That’s where a new platform for domestic payments is needed. Phone apps like Apple Pay and Samsung Pay have already moved into the m-commerce space, yet they are e-wallets, which only emulate the contactless operation of a plastic card on an NFC-enabled point-of-sale terminal. Nothing has really changed: The payment is still processed by the Visa/Mastercard Card Scheme. The fee structures are still opaque and excessively high. The same inadequate security measures prevail. The same onerous conditions are still applied to merchants. And if the merchant doesn’t support contactless card payments, the payment app on the consumer’s smartphone is useless. These e-wallets also alienate the local banking industry by reducing margins or taking market share. 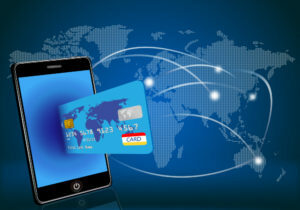 To effectively exploit the m-commerce opportunity and counter the market power of the international card schemes, central banks need to foster domestic schemes that are capable of operating independently of the international card schemes.